Topics below: Updates on Howling For Wolves at the State Fair, Washington, D.C. anti-wolf bills, and the latest Minnesota wolf population estimates. SEE US AT THE MINNESOTA STATE FAIR! 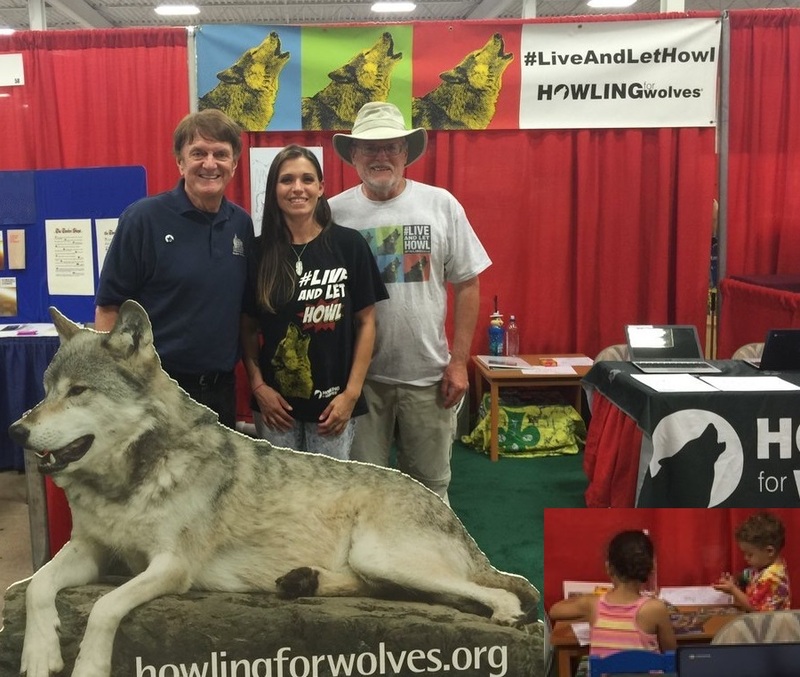 Howling For Wolves is having a productive 2016 State Fair. From now until Labor Day, Howling For Wolves has a booth in the Education Building gathering electronic signatures and educating the public about the plight of wolves in Minnesota and throughout the country. So come out, stop by, and talk with other wolf advocates! We have wolf buttons, a life-sized wolf image for photos, and our laptops to gather real time signatures to our online letter to federal lawmakers. Howling For Wolves is vigilant at our nation's capital working to stop bad wolf bills. Unfortunately, there are active threats to the wolf in bills moving forward in both the U.S. House of Representatives and the U.S. Senate. If enacted, these bills would remove federal Endangered Species Act protections for the wolf and the courts could not even review them. If this happens, destructive state plans will occur including wolf trophy hunts. One hidden threat is in the U.S. Senate's Interior Appropriations bill. The proposed amendment which is also hidden in other bills doesn't even state the words "wolf," "delist," or "endangered species." The language is disguised as a "re-issue" rule and contains a "no judicial review." This bill language makes it impossible to know that a lawmaker voted to delist the wolf. This could be attached to a must-pass omnibus spending bill or even a continued resolution (CR). For now, we all need to continue to tell our own federal lawmakers that the wolf matters to us and the wolf continues to need federal protections. A "clean" continuing budget resolution, without anti-wolf policy riders, is needed. Please send a letter to your Member of Congress here and ask others to engage. Even if you have taken the action recently, this is a very important time to restate your position and make a brief comment, so that lawmakers know that you want them to fight anti-wolf amendments. We are monitoring congressional threats to the wolf's existence. More information, including votes taken by Minnesota's Members of Congress, can be found here on the Howling For Wolves website. Last week the Minnesota Department of Natural Resources (MN DNR) released its 2015-2016 wolf population estimates. The results indicate the Minnesota wolf population has not returned to pre-trophy hunt estimates. The current estimate is below those of 1998. Most importantly is these are not actual wolf "counts." The population estimates by the MN DNR are very rudimentary and they actually count only 6% of the wolves that they claim exist! The rest is statistics on old data that is vague at best. What we do know is that the MN DNR confuses wolf recovery with keeping wolves just above the brink of extinction. The population levels say nothing about what is needed for responsible wolf recovery and for vital genetic diversity. The Howling For Wolves press release can be found here, and media coverage included KARE 11 NBC-TV: Wolf Population Shows Uptick in Minnesota, St. Paul Pioneer Press: Minnesota wolf population stable, state says, but 'barely above the brink of extinction,' anti-hunting group cries, and Bring Me The News: Minnesota's wolf population is stable, DNR survey says. With your support and active work, we are moving forward for the wolf. Copyright © 2016 Howling For Wolves, All rights reserved. You are receiving this email because you previously sent a message through HowlingForWolves.org.